You are here: Home / Just for Fun / National Grammar Day: You’re Celebrating With Your Friends Today, Right? Yes, it’s another random holiday to celebrate. 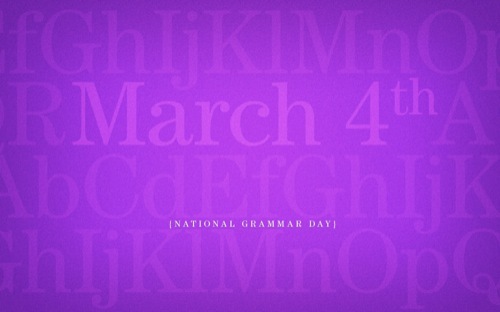 Today, March 4th, is National Grammar Day. A day to “March forth” to speak well, write well, and help others do the same. “I.e.” and “e.g.” mean the same thing. You use “a” before words that start with consonants and “an” before words that start with vowels. Grammar Girl notes: Read the explanations before you write to express your outrage. You can read brief explanations on these myths.